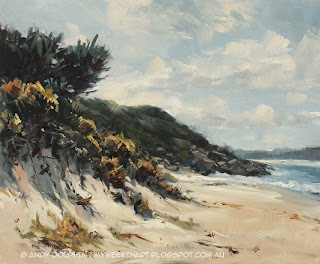 On Wednesday I headed down to Misery Beach, near Albany. I'm not sure how this gorgeous and secluded little beach got its name but one popular suggestion is that waste products from the nearby whaling station used to wash up here before the facility ceased operations in 1978. Conditions were mostly overcast when I arrived but the sun did break through in short intervals every ten or fifteen minutes, or so. It was windy too! 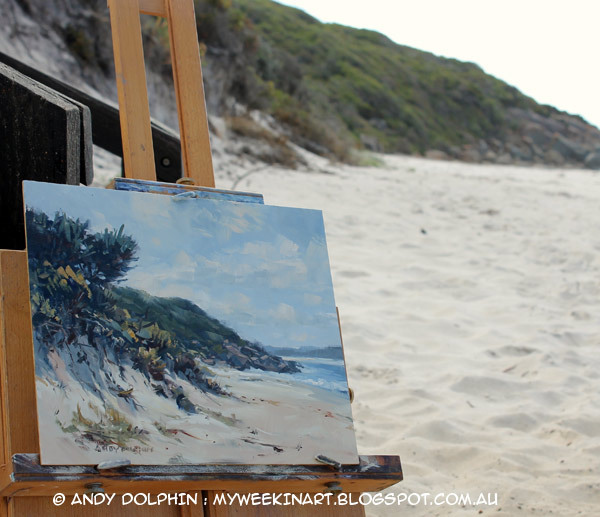 It's been a long time since I've set up the easel on beach sand and it's always an interesting challenge. The legs have to be fully extended and pushed into the sand - because they're going to sink in anyway and you don't need that happening while you're painting. And you have to be careful not to get sand into everything when you're doing stuff you normally don't need to think about. Oh, and don't drop a brush full of paint into the sand. It's a nuisance. I know because I did it. Luckily it was only my rigger so it was easy to clean. If you drop your main brush, you'll almost certainly end up spreading grains of sand across your painting unless you have a large jar of solvent you can rinse it out in. Anyway, here's the location shot. I had to fold up the easel and lean it against a stair case because the wind was threatening to blow it over if I walked away while it was still set up. And here's the finished piece with no adjustments or additions made later. I used a very limited palette for this one to keep things simple. Because of the overcast conditions, I went for ultramarine, burnt sienna and yellow ochre. I chose these colours because the actual scene reminded me of one of the paintings in the "oil painting in different palettes" exercise I did last year. It was mid-afternoon when I painted this. The key to it, and what attracted my attention, is the shadow being cast half-way down the face of the dune and the way this shadow-highlight line zig-zags into the scene. One hour earlier that shadow wouldn't have been there at all. One hour later, as I was finishing, the shadow covered the whole face of the dune. Either case might still have offered the opportunity for a satisfactory painting but each one would have a different feeling.